I shared with my new New York friend that I also have an 'upcycled'* litter box system, and promised to send the information. I go on regular expeditions to WalMart for the (free) raw materials of my litterboxes. Every time I go to Wally World I pick up some Gatorade beverage 'flats.' These are the boxes that hold 6-packs of Gatorade and Low-Cal G'Ade on the shelves. The two kinds of boxes nest, so I stack them in pairs in the shopping cart, and I also pick up a few large boxes from Angelsoft or another kind of toilet tissue. 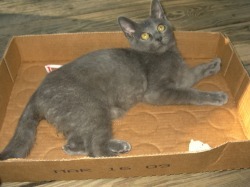 At home, the beverage 'flats' are great for kitty beds and lounges, usually lined or covered with an old t-shirt. Even better, they make super, disposable, litterboxes and kitty 'bathrooms.' The two types of flats, nested, are sturdy enough for a few days' use. When the inside box gets a little soggy, I scoop it one last time, then pour the relatively clean litter into the large box. (If I think about it I replace the smaller box, which is the litter box liner. )Then I place both of the boxes into the larger box to make a litter 'hut.' Talk about no-mess! I feel a little guilty that I'm sending a lot of materials to the landfill, but they will continue to break down when exposed to water.